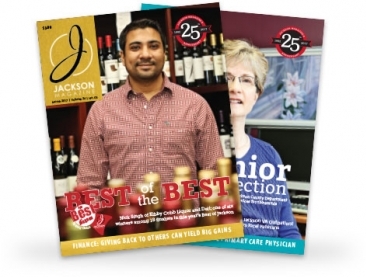 For the past 25 years, Jackson Magazine has been highlighting the positive aspects of the local business community. Each issue, which features a different theme, highlights local companies, organizations and people who are making an impact in Jackson. Also included are Health Care, Finance and Viewpoint columns written by local experts in their respective fields. Find out what Jackson Magazine can do for you; contact Marie Page at 517.783.2637 for more information. Each issue reaches more than 20,000 readers every month. First, Jackson Magazine is printed and distributed monthly to 6,000 - 8,000 executives, managers and professionals in our area. Next, the pass along rate is greater than 10,000, as people view the magazine in waiting rooms and reception areas throughout Jackson County. Third, the online edition of the magazine receives approximately 2,000 visits each month. Let us help you make the most of this opportunity to promote your business, influence community leaders and decision makers and to support our community. 90% of all Jackson Magazine subscribers are in top management with discretionary authority to make or influence purchasing decisions. Your ad is seen for months as 74% of our readers pass the magazine on. People read it cover to cover – 71% read the magazine completely and 40% spend more than an hour reading each issue.